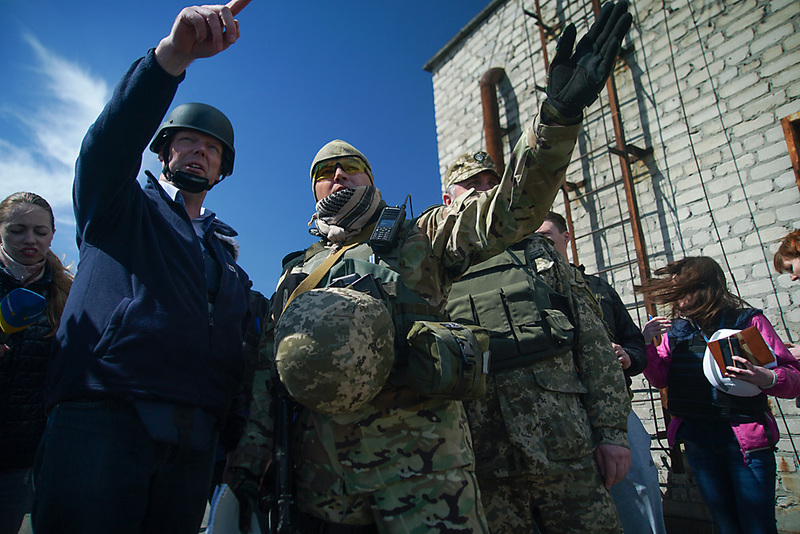 Alexander Hug, chief monitoring mission of OSCE in Ukraine, left, and Ukrainian military servicemen, members of Joint Center for Control and Coordination (JCCC) mission point at a side of the newly installed OSCE surveillance camera to register violations of ceasefire in Avdiivka, eastern Ukraine, April 16, 2016. The Ukrainian side's claims that Russian President Vladimir Putin agreed to the deployment of a certain armed police mission of the Organization for Security and Cooperation in Europe (OSCE) in Donbass during contacts within the 'Normandy Four' are not true, Kremlin spokesman Dmitry Peskov said. "Claims that the recordings of 'Normandy Four' conversations contain certain indications that the Russian side agreed to the deployment of a certain OSCE police mission are not true. There are no such indications," Peskov told reporters. "There are no agreements on this issue either," he said. "There is a readiness to discuss this topic with the understanding that adopting any decision without heeding the positions of Donbas representatives is not deemed possible," he said. Savchenko swap: Will there now be a breakthrough in Moscow-Kiev relations? When asked about the role of an OSCE armed mission, which is currently being discussed in the media, Peskov said that "all discussions are dealing with an observation mission on the contact line [in Donbass]." As far as this mission is concerned, "contacts are under way at the expert level", Peskov said, declining to provide further details. It was reported that on June 1, Ukrainian presidential administration deputy chief Kostiantyn Yeliseyev said that the Russian side had agreed to the deployment of an armed police mission in Donbass. For its part, the Russian Foreign Ministry said that Russia had not agreed to the deployment of a paramilitary mission in Donbass, and that these issues should be discussed in appropriate formats. Can Putin and Poroshenko agree on sending peacekeepers to the Donbass?